We’ve written before about tattoos in our post Tattoos and the Body as Canvas. How from ancient times people have etched into flesh the story of their lives. From designs that heighten beauty, signify status, show affiliation or even scourge a social outcast, tattoos have always been about designations. Indeed, our body as canvas is at once both intimate and public. For some, tattoos depict their innermost beings for the world to see. For others, particularly when used to announce a person’s outlier status in society, tattoos are meant to be felt as a visceral destruction of self. But let’s look deeper into this phenomenon of inner and outer self-views and how contemporary tattoos specialists are forging new ways of inking our very human canvas. When the inner and outer worlds are at odds, it results in a paroxysm of identity for a person. This is particularly true for people who’ve experienced trauma to their bodies—where scars stoke memories of things wished to be forgotten and often obliterate a true sense of self. Today, a new process using age-old practices is restoring people to wholeness. Basma Hameed is a young woman whose own body tells a story. Burned by hot oil when only a toddler, she suffered through more than 100 surgical procedures through the years. She endured bullying by other children and as a teen was told by doctors that nothing more could be done for the angry red patches across her face. Realizing that further restoration was to be done on her own, she eventually turned to the ancient art of tattooing and became a para-medical tattoo specialist. Her best patient? Herself. “I think that I’m good at para-medical scar camouflage because I was able to work on myself” she said in a CBC News interview. After approving of her own results, Hameed honed her skills and established her own practice helping other people with scarring problems. Using micropigmentation to blend different colors to match the skin, Hameed tattoos the damaged areas to obscure scars and discolorations. She has an artist’s eye as she meticulously paints the canvases of faces and bodies, bringing together once more the inner and outer selves of her patients. Rather than being defined by their scars, they now can re-claim their own identities. Today Hameed is helping others through her Basma Hameed Survivors Foundation. Listen to her story here. Read our earlier blog, Tattoos and the Body as Canvas, and take a look back at ancient tattooing and modern identity. Harris, S. (2014, December 30). 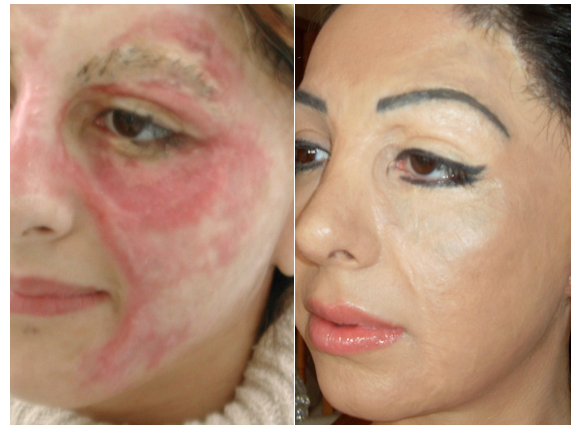 Basma Hameed creates booming business tattooing scars. Retrieved January 15, 2015. This entry was posted in Beauty, Blog, Crime, Culture, Healing Arts, Human Rights, Public Life, War and Violence and tagged ancient art, ancient history, ancient tattoos, AntiquityNOW, Basma Hameed, scar removal, tattoos over scars. Bookmark the permalink.